Green is the buzz word of the millennium. Everyone wants to be a part of the Green Movement, but most do not know how to do it. So I am going to take the principles of green construction and apply it to the remodeling of a kitchen. There is no such thing as getting a green certification for your kitchen unless it is part of a total house remodeling, but that shouldn’t deter you from applying some of the common sense principles. Recycle: Create a built-in collection space. This collection space encourages sustainable living for the occupants. Recycling becomes convenient and a daily part of your life. Collection spaces should be designed with odor and air quality in mind. Your positive decision should not create a negative situation elsewhere. Use of Reused or Salvaged Materials: Your old cabinets could be used in other locations in the home, or possibly donated to such organizations as Habitat for Humanity. Consider updating the kitchen cabinet door panels and not replacing the existing cabinet structure. Salvage old hardware. Recycled-Content Building Materials; Countertops and hardware are good examples of selecting materials made from recycled content. Recycled Construction Waste: The goal here is that construction waste is recycled and hazardous materials are handled and disposed of properly. This is different from Recycled-content. It is mainly concerned with the recycling of new construction materials, such as drywall, plastic, cardboard, wood, etc. The recycling of these materials takes place off site. Renewable Materials: Renewable materials are considered biobased. Biobased materials are made of renewable agricultural materials (plants, animal, and marine materials) and forestry materials. Try to maximize the use of renewable materials in your kitchen remodeling. Indigenous Materials: The object here is to think about what products are produced locally. Materials produced locally and are renewable and regional would be good sustainable choices for your remodeled kitchen. Energy Efficiency: When you think of Energy efficiency, you think of appliances. To think of appliances is to think of energy. Appliances use a lot of energy, making the kitchen one of the most energy consuming rooms in the house. The important point is when thinking about a sustainable kitchen, think of energy-efficient appliances. Lighting is also a critical component in your decision making. Use appliances and lighting fixtures with Energy Star ratings. 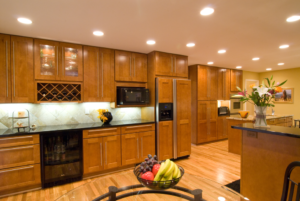 Consider installing sensors on the kitchen lighting so that the lights only are on while in the kitchen. Another item to consider is induction cook tops. Water is a resource that is becoming more and more depleted. Water preservation is important to the future of society, and this needs to be impacted through using water efficiently in our homes. Kitchens use water in cooking and cleaning process. Kitchens impact this by the use of hot water, dishwashers, food waste disposers, faucets, laundry washers, and even ice makers. In order to reduce indoor water usage, certain steps can be taken: the design and location of a kitchen relative to hot water can help reduce water usage and energy consumption. Food waste disposers reduce the amount of waste sent to landfills. Certain building products, such as cabinets, can emit toxins into the air. Choose products that eliminate or reduce the presence of these toxins in building products and furnishings. Flooring in kitchens generally is limited to hard surface products. You do not see too many carpeted kitchens. The hard surface must be durable and cleanable. Some hard surface flooring is made with glues that also emit toxins into the air. Select materials that emit low or no levels of toxins. Architectural coatings such as paints, stains, and varnishes potentially can have VOC’s (volatile organic compounds). Pick the coatings that have zero VOCs. Remove pollutants produced by daily kitchen activities. A kitchen exhaust plays a role in sustainable kitchen design by eliminating odors, moisture, grease, and pollutants created by cooking and frying. The exhaust should be vented to the outside. These suggestions will start you on your way to being greener in your decision making. This naturally should extend your thinking to other rooms in your house as well as your position on doing your part to help save the planet. If each of us implements just one or two of the ideas mentioned above, we’ll be better off and start our way to a better future. As always, the Stan Better Family of Companies are here and ready to help you should you need our assistance.